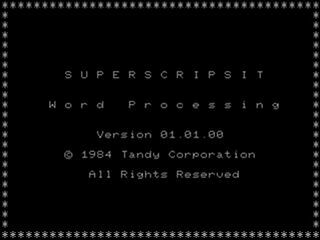 Scripsit is a word processing application written for the Radio Shack TRS-80 line of computers. Versions were available for most if not all computers sold under the TRS-80 name, including the Color Computer and several pocket computer designs, as well as the Tandy version of the Xenix operating system. Some of these versions are tape-based and have no ability to read or write to disk.